Bring sugar, water and cinnamon to a boil while whisking it together. Add nuts and salt. Stir constantly. Continue stirring until it seizes up and you just start to smell it roasting. 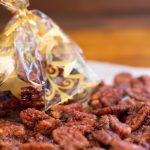 Immediately pour the nuts onto parchment paper and separate with forks. You have to do this quickly or the nuts will stick together.